San Mateo Police have arrested a suspect connected to an early morning arson that left one person dead. San Mateo, CA – The San Mateo Police Department is actively investigating a serious gang-related arson incident that left an 85-year-old grandmother dead. Police have arrested a suspect after an extensive, around the clock investigation that led officers to a home in East Palo Alto, CA. In the early morning hours of Tuesday, February 19, 2019, San Mateo Consolidated Fire Department (SMCFD) and San Mateo Police Department (SMPD) were dispatched to a home on fire on the 100 Block of S Humboldt Street in San Mateo. Fire crews evacuated four people from the residence and an additional two people from the detached garage, while police officers evacuated nearby homes. Residents informed SMCFD that one occupant was unaccounted for, so fire crews entered the burning home to attempt to rescue Susana Tonga, an 85-year-old grandmother. Fire crews found Mrs. Tonga and pulled her out of the home. She was unresponsive and they performed CPR, but Mrs. Tonga did not survive. Working in partnership with SMCFD, San Mateo Police launched an intensive investigation as to the cause of the fire and responsible parties. Through investigative leads, SMPD learned the fire was a targeted gang related attack. A comprehensive investigation led detectives to a home at the 2300 Block of Oakwood Drive in East Palo Alto. On Friday, February 22, 2019, at 8 P.M., the North Central Regional SWAT Team served multiple search warrants and detectives questioned several parties related to the arson death investigation. 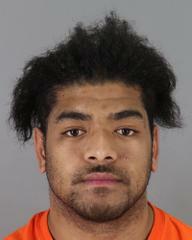 Fifita Tau was identified as a responsible person for the arson and murder of Susana Tonga. He was arrested and transported to San Mateo County Jail. We mourn the loss of our community member, Susana Tonga. Our hearts and prayers go out to the family in the death of their loved one. San Mateo Police detectives are actively working this investigation. Anyone with information on this senseless tragedy is encouraged to contact Sgt. Lee Violett at (650) 522-7650 or by email at lviolett@cityofsanmateo.org. Anonymous tips can be submitted to http://tinyurl.com/SMPDTips or by calling (650) 522-7676. Remember, if “You see something, say something.” We’re encouraging our community to utilize security cameras. They are especially helpful in identifying suspicious activity in neighborhoods when cameras are street facing. Our officers regularly canvass for surveillance and you can help us by notifying SMPD where cameras are located in your neighborhood at www.cityofsanmateo.org/Nest.